The Transits of Venus have provided some of the most remarkable stories in the history of astronomy. There are famous names and celebrated expeditions. Captain Cook’s first voyage around the world was planned so that the 1769 transit could be observed in Tahiti. For the same transit, King George III had an observatory specially built so that he could conveniently view the event near London. 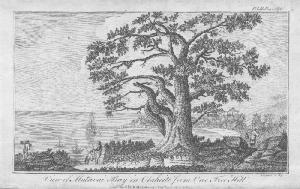 View of Matavai Bay, Tahiti from One Tree Hill, 1769. There are also touchingly human tales of misfortune. The French astronomer Le Gentil missed the transit of 1761 while aboard ship in the Indian Ocean. Rather than returning home he stayed on for the 1769 transit, only to have bad weather prevent his observations the second time around. However, the resources of this website are based principally on collections of objects and images, rather than people. Yet such materials often have their own stories. As part of the longitude determinations of the 1874 transit, two chronometers were sprinkled with vinegar and sent out in an open boat to overcome quarantine restrictions at the Seychelles (NASA ADS site). At the other extreme from such surreal isolation were demonstration devices designed to bring astronomy to the public. 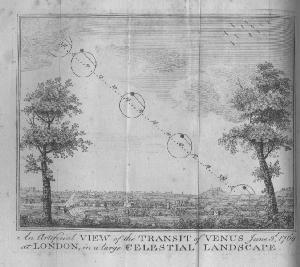 The lecturer and scientific instrument maker Benjamin Martin devised a large wall-mounted apparatus to show the transit of 1769 as it appeared in London. He used the artificial transit in lectures given in his shop but, as the day itself approached and public interest grew, had to find a larger room in a nearby tavern: astronomy in the pub! This section of the website will be expanded to highlight further material as the database grows.